Do you have a trading plan? How many times did you break your trading rules? Why did I not follow my trading plan? If I did, I would not have ruined my trading account. Why can’t I control myself and follow the rules? If you have a trading edge, you need the willpower to follow your rules to realize the profits. If you are looking for a trading edge, you still need self-control to follow your trading rules. If not, you will never get enough data to separate the wheat from the chaff. The lack of self-control plagues many traders. And it’s a huge problem. It blocks you from achieving consistent trading results. A single episode of willpower depletion can bankrupt your trading account. You might think that self-control is an innate ability. You either have it or you don’t. But Roy Baumeister disagrees. According to this leading researcher on willpower, you can improve your self-control ability. His research offers incredible insights for improving self-control. Willpower is a muscle that tires. It is also a muscle that you can train. Willpower is tied to goal-setting. External factors help increase willpower. Self-control might not be enough. Every trade requires you to follow your trading rules and control your emotions. Every trade consumes willpower. This means that with each trade, your willpower drops. It follows that the more trades you take, the more likely you will lose control and start flouting rules. If you need a reason to stop over-trading, this is it. Aim to take one trade with complete control, and not a dozen trades with no rhyme or reason. Decision fatigue sets in when you are required to make too many decisions. Your willpower falters and your trading decision suffers. Don’t let too many decisions creep into your trading process. Boot up your trading computer. Decide what market to trade today. Decide which time frame to look at. Open up three charts. Try to decide which chart to pay attention to. Decide if you should pay attention to the RSI, the MACD or the moving average. Choose among the ten trading strategies you learnt over the past week. By the time you start to trade, you’ve already used up much of your willpower unknowingly. To avoid decision fatigue, adopt a minimalist trading approach. Focus on trading one market with one chart (time frame). Use price action. That’s what I do. And that’s why I can devote my full effort to finding good trading setups. 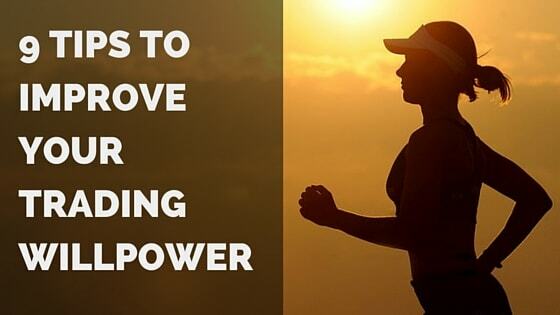 With a healthy lifestyle, you can improve and hone your willpower. But there is no overnight hack for this. Learn more way to strengthen your willpower here. A clear link exists between willpower and glucose – read this paper. Self-control failures are more likely when you have low glucose or cannot use them well. Glucose might be bad for weight-loss, but you need them for self-control. Traders who are on an extreme low-sugar diet will find it harder to exert self-control. When you trade, remember this biological link. Willpower – is it all in your mind? No. Some are in your blood (sugar). The goals you set are critical. If you set conflicting goals, you are using your willpower against yourself. In other words, you are setting yourself up for failure. They are conflicting because your trading rules cannot guarantee a daily stream of income. In your pursuit of daily profit, you ignore your trading rules. When you follow your trading rules, you fail to extract a profit on some days. Conflicting goals are not sustainable. They do not encourage self-control. On the other hand, complementary goals enhance willpower. As you aim to go for lunchtime yoga sessions, you need to end your trading by lunchtime. This means limiting your trading to the morning. It helps you to trade less by avoiding the low volatility lunchtime price action. Go ahead and plan your own complementary goals based on your circumstances. Peer pressure works. The idea that you are being scrutinized helps to enhance willpower. Why do you go to work everyday? That’s because you are held accountable. You know that your boss checks on you. Why do you deviate from your trading plan? Perhaps because no one is holding you accountable. Ensure true accountability with a trading buddy. Need help finding a trading buddy? Try searching for trading groups on Meetup.com, or start your own. If peer pressure works, why not peers pressure? Start a trading journal on a forum. Get a whole community of traders scrutinizing you as you trade and record. You will get all sorts of feedback from online traders – both constructive and nonsensical. Paying attention to the wrong feedback is frustrating and a waste of time. Remember the aim of your trading journal. It’s to improve your trading willpower. It’s to absorb helpful trading ideas. It is not to prove that you are profitable or an excellent trader. Ignore caustic and unhelpful remarks. Will you be tempted by the delicious fat-laden burger? Yes? Then don’t walk into the burger joint in the first place. The point is your willpower will fail. And when that happens, you need a backup plan. In trading, you can use a similar strategy. Anticipate failure of your trading willpower, and devise a strategy to deal with it. If you tend to risk too much in your trading, then limit the amount you deposit in your trading account to begin with. Do not deposit your entire risk capital into your account. Deposit just enough for your trading strategy to work. In the same vein, withdraw your profits systematically. It helps to protect your hard-earned profits from a lack of trading willpower. Consciously repeat the right acts, and form a habit. Once an act becomes a habit, you no longer need willpower to perform it. For instance, I have a habit of setting a stop-loss order and a target order once I enter a trade. This act does not consume my willpower. Identify simple acts within your trading process. Then, make a conscious effort to develop them into habits, one at a time. The best traders build their habits around risk management. For instance, setting stop-loss, avoiding setups that are too risky, and limiting daily losses. Once you get into the habit of controlling risk, your trading consistency goes up. A new trader looks for answers outside; a seasoned trader solves problems inside. A desire to improve willpower is a mark of a seasoned trader. Want to fuel that desire? Check out these books and videos.